Our custom workwalls can be made to measure for just about any office space. Purpose built with office executives in mind, our custom workwalls are smart, functional, and organised. At Après Furniture we give you the freedom to specify your own office workwall solution tailored to your cellular space and requirements. Our in-house designer will assist you in every step of the design process for your custom made workwall while giving you the best advice for the most efficient cellular office solution. 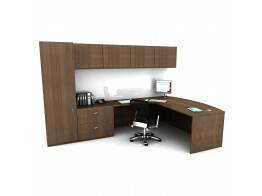 This versatile piece of uniquely designed office furniture allows you to work at your desk in comfort, whilst providing easy access to all of your personal files and belongings in easy-to-reach storage areas. Mobile pedestals can be incorporated for added flexibility and all of our custom workwalls feature the potential for integrated cable management, to allow IT equipment to be safely and discreetly connected. With an impressive number of high quality veneers to choose from, your bespoke workwall can be matched to any existing furniture or be used to create a striking contrast. Want to display your awards, certificates or personal items in style but don’t currently have the space? With a customised workwall we can help you to design shelving and stands to perfectly accommodate your belongings and show them off at their best. Our range provides truly innovative desking and storage solutions, and can fill an entire wall if required, to maximise the potential of your cellular office space. With a desk return stylishly connected and integrated to the main piece, bespoke workwalls are both multifunctional and aesthetically pleasing. 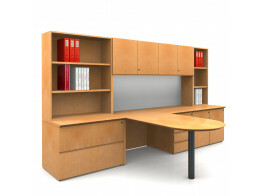 Custom Workwall Desk is a prestigious furniture solution for cellular executive office workspace. Crome Workwall is a custom made solution for cellular executive office environments. Custom Workwalls, designed by Sergio Lion, offers sound-damping and variations in size, finish and accessories. Custom Made Workwalls are bespoke executive storage and desk solutions for cellular office spaces.